This is a top quality, use every day, AM/FM Radio with Multi-purpose Emergency capabilities. 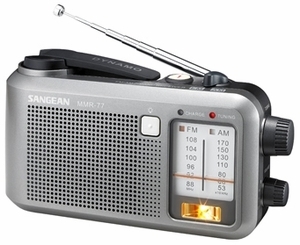 Sangean has a reputation for making radios of high quality, high durability, with a powerful signal reception. When a disaster comes you will need a radio that is tough, powerful and has the ability of picking up weak radio signals. Dynamo Powered - Wind for 1 Minute, plays for 30 Minutes w/no other power source required. Simply flip-up the compact wind handle, crank it for 60 seconds and the radio will power itself for 30 minutes.